STAMFORD — Big time players make big time plays in big time games. It’s as cliché a phrase as there is in sports, but after Darien’s 28-21 FCIAC football championship victory over New Canaan Thanksgiving morning at Boyle Stadium it was the perfect way for coach Rob Trifone to sum up the win. With the win, Darien (9-0) clinched the No. 2 seed in the Class LL playoffs, just fractions of a point behind No. 1 Shelton. The Blue Wave will host FCIAC-rival Staples on Tuesday in the state quarterfinals at a site and time to be determined. New Canaan (8-1), the defending Class L-Large champion, fell out of the Top 4 and down to sixth with the loss. The Rams will visit No. 3 Windsor in Tuesday’s quarterfinals. The biggest play came with 4:14 remaining in the contest: Darien quarterback and FCIAC championship MVP Timmy Graham rolled to his right and lofted an 8-yard pass to Hudson Hamill in the back of the end zone. Hamill — who threw the winning TD pass in last season’s FCIAC win over the Rams — made an incredible leaping catch to break the 21-21 tie, hauling in what proved to be the game-winning score. That second-and-34 came after New Canaan’s Mike Cognetta intercepted a Graham pass and the Darien defense held, forcing a 46-yard field goal attempt for the Rams. New Canaan kicker Peter Swindell — Connecticut’s all-time leader in made field goals — pushed the kick just left to give Darien the ball at its own 36. From there, Graham and the Blue Wave went to work until a penalty and a sack forced the long second down. Graham dropped back and hit a streaking Minicus with a beautiful pass down the right sideline to set up the winning score. The New Canaan defense did intercept Graham twice and Michael Collins threw one touchdown and rushed for another, but couldn’t respond to Darien’s late score. The Rams had two chances to do so — the first time on a fourth-and-10 that ended when Darien’s Mark Evanchick sacked Collins. With under two minutes left in the game Collins hit Kyle Smith on a deep pass over the middle, but the Darien defense converged and forced a fumble that Christian Trifone recovered to ice the win. Andrew DeFranco ran in New Canaan’s other score from a yard out. Collins finished 19-of-40 for 205 yards and a touchdown. For Darien, Hamill caught a 29-yard touchdown in the first quarter and finished with 105 all-purpose yards. Minicus tallied on a 39-yard stop-and-go and finished the day with 10 catches for 169 yards. Darien’s Rock Stewart had a 28-yard score on second-and-25. 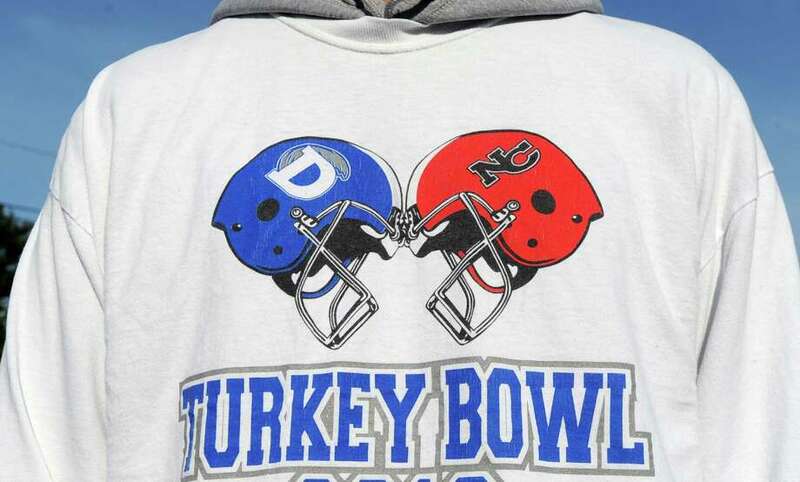 The win was the fourth consecutive in the Turkey Bowl for Darien, meaning the senior class has never lost the Thanksgiving rivalry game. Although, New Canaan has twice defeated Darien for the state title in that span.